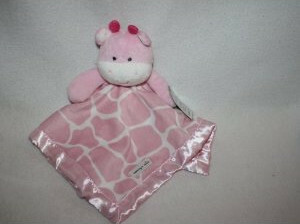 The most distinguishing feature of a giraffe is its long neck which Henrietta does not have. I think she could be a spotted hippo just as easily as a short-necked giraffe. That's how I feel about it. Not only does she have no neck, but her face lacks the general elongation of a giraffe's. I don't know how you'd explain the horns, but I think hippo is easily as valid a description as giraffe. I don't know if it made any difference, but I slept with Henrietta for a few nights before giving her to Heather. Supposedly, that would have bestowed my scent upon her, making Heather like her better. I can't smell my smell, though, so I have no clue if it worked.